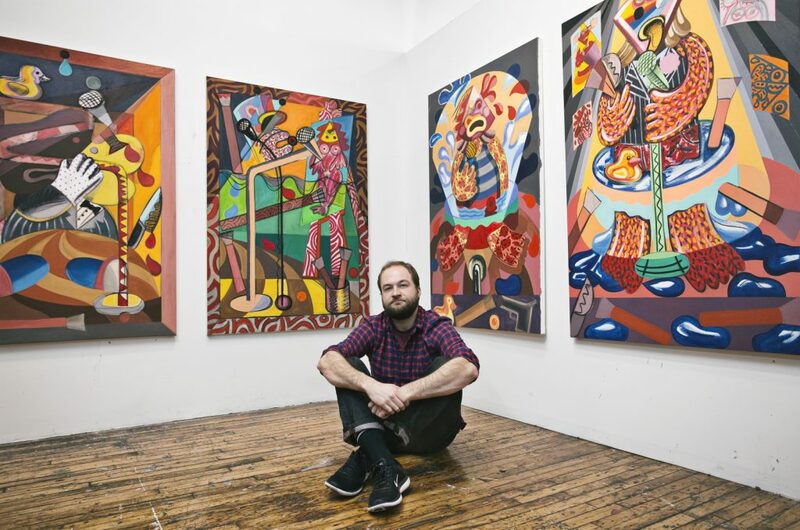 Peter Schenck in his Brooklyn studio. Image courtesy of Maxim Ryazansky Photography. 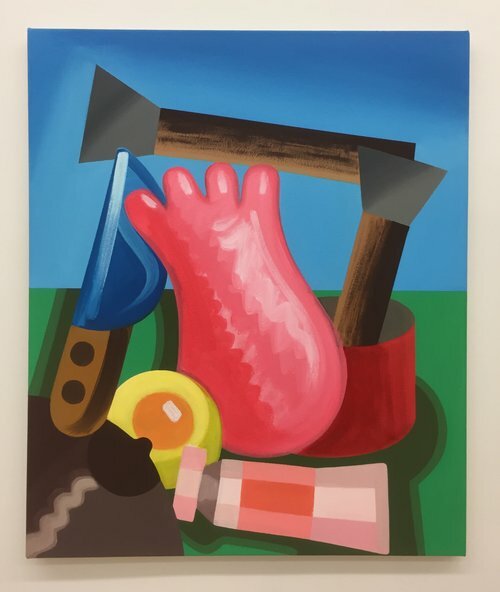 Contributed by Julia Gray / Painter Peter Schenck combines hard-edge abstraction with gestural brushwork and vivid color to create densely patterned scenes that capture a cast of characters caught in awkward moments. Almost collage-like in concept and practice, his paintings merge elements from his own life and imagination with found images and fragments from his favorite artists’ paintings. The use of flattened, Cubist-like forms manifest the notion of collage more visually. I recently visited Schenck at his Brooklyn studio, where we talked about his visual language, his heroes, and how he uses anxiety as a subject. Paintings and drawings on a wall in Peter Schenck’s studio. Julia Gray: Your work incorporates a lot of bold, almost visceral patterns and bulbous shapes. Do you have specific patterns or forms you use for certain characters, scenes, or moods? Peter Schenck: There’s an intuition. I definitely wanted to make that pattern and then certain things kind of catch up to each other. In all these paintings, I’m interested in an awkwardness. Awkwardness in life, awkwardness in painting and in anxiety. It might not have been on my mind when I started the paintings. A weird guy on the stage, he’s front and center so he wants to be seen, but he’s doing weird things, clutching things, licking the mic…so maybe he’s not having such a great time. I’m interested in however much that comes across with a lot of these figures. The figures are pretty abstracted but always caught in this thing– how good of a time are they having? How awkward do they feel? Graphically, the colors the actions feel humorous. But when they work on a weirder level, which is what I’m going for, these are kind of sad paintings. Certainly a hero would be Peter Saul: a lot of color and funniness, but a lot of really dark paintings. There are two Peter Saul quotes that stick with me. One is like, “you have to try really hard in painting for the painting not to become furniture.” He also said something about liking a certain amount of misery in his paintings, which I like. If it attracts you, you can’t ignore it. It’s not just this thing that’s above a couch. Not everyone needs to make those paintings, but that’s definitely something I’m trying to pursue. You also want them to be accessible to people. Peter Schenck, Endless Summer, 2017. On view at BravinLee Programs in “Sitting Still,” through November 29, 2017. JG: What kind of world do your characters live in? PS: It’s often shallow, diorama-like domestic spaces that can be associated with a certain familiar reality. Although these characters can be almost monster like in their depiction, I’m interested in their surroundings: simple interior rooms or occasionally, ambiguous open “field like” landscapes. In some paintings, I provide a lot of clues that the room my figures are in may be an artist’s studio where brushes and paint buckets can be found, or may be a comedy club when a stage and microphone are depicted. Other paintings, I’m content to just acknowledge more ambiguously that there’s simply a wall behind my figures. The use of a light source, or the “shape of a light source,” cuts into these figures and kind of places them again in an interior space. I want the notion that these figures, while cartoon or monster like, live within a world close to our own reality. JG: Do you base your painted world off of actual things you’ve witnessed or are they just manifestations of your imagination? PS: I’m influenced by the strangeness and humor of everyday interaction. It’s something that we all feel and I want to express, kind of the Charlie Brown thing of daily life, like getting something spilled on you or you do something stupid. I like the idea of Matissean shapes and spilling things, things spilling on each other. In my mind, there’s this idea of a figure trying to carry on but all these ridiculous things are happening around it: things are spilling and out of control. Like I said, that Charlie Brown thing: you’re doing your best, but bad things are still happening around you. For a short while I was living in Philadelphia and doing stand-up comedy. I didn’t know if it really had legs. That experience kind of comes through in some of my paintings with the microphones. I don’t know how much I need the viewer to know what it means, it’s really just an apparatus in the paintings. They’re just characters, but some of them reflect a form of my experience, too. Like in this one, I wasn’t standing in a kiddie pool, but I kind of like the interesting dumbness of including it. The experience in these staged settings interest me. Peter Schenck, Down the Well, 2017, acrylic, charcoal, flashe, gouache on canvas 60 x 40 inches. 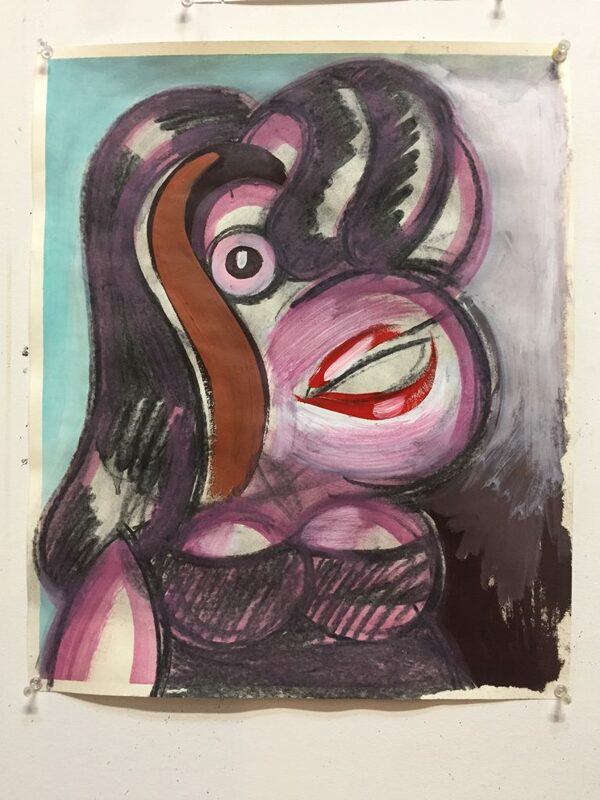 JG: Looking back at your earlier work, you seem to have moved from gestural abstractions to super geometric and tight images, and now you kind of incorporate the two. How did you get here? PS: My education at Boston University was very focused on the figure and still-life, object-focused, so that was really ingrained in me. I almost tried to grow away from that. But I definitely started to draw from it in my own way with more flattened forms, but still interested in the figure and the object. But it’s not in me to make a figure that actually looks like a figure. I’m trying to throw a lot of stuff into the figure. I want to see how the gesture and the figure can kind of paint together. I like to draw inspiration from a lot of different artists and sources. For a while I was really into Frank Stella and Joseph Albers. But I feel like there’s a danger in drawing from just one source. My drawings are invented, but now I might draw from a specific Picasso painting, and then maybe my version of a non-existent Picasso head. JG: What do you think is an artist’s role is in a darkening political landscape? Do you think an artist has a role at all? PS: I don’t necessarily need in my own painting, or artwork by others, to have specific examples of the current political climate. I have done a few paintings specifically targeting that darkening reality, but I prefer more oblique references. An example of this is my own nod to the chilly blue and gray still life paintings that Picasso made in the midst of World War 2, he painted some great, but painful works with skulls, burning candles and ominous, prickly objects. I’ve become interested in depicting skulls in some of my works to describe to myself just some of the darkness currently around us. That said, I think artists like Kara Walker and Peter Saul recently have made historically significant works reflecting the current political situation. I’m happy those paintings were made, but I don’t think everyone has to make them. I do think an artist has a role to play, but every artist is different in their approach to understanding and pushing against the current political agenda. I’m not always sure how much you can clearly address a political agenda when you have largely a solitary practice of working alone in your studio. I do think by just continuing a practice of trying to make thoughtful and beautiful things that you are putting yourself on the right side of history and not on the side of much of what politics has become. “Sitting Still,” BravinLee Programs, Chelsea, New York, NY. Through November 29, 2017. By appointment through December 13. 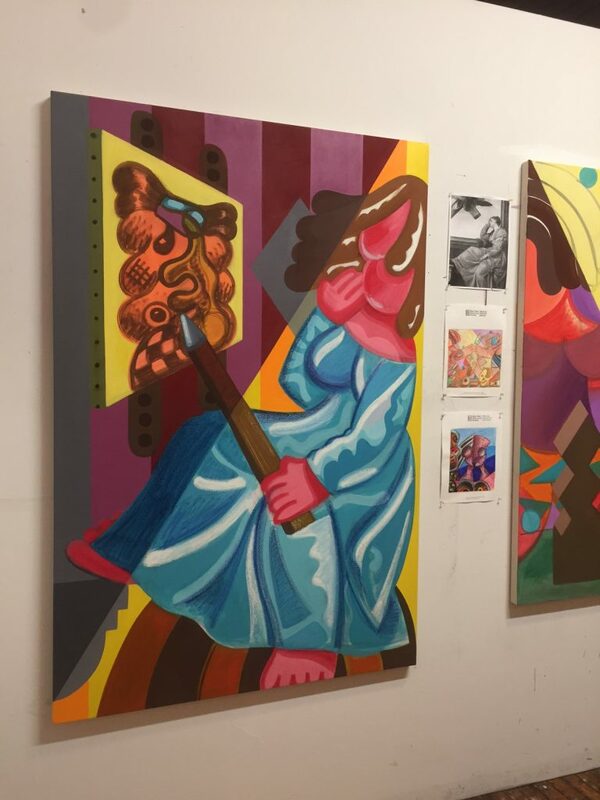 “Et Tu, Art Brute?” Andrew Edlin Gallery, LES, New York, NY. Through January 28, 2017. Drawing Show, curated by Kenneth Heyne. Rover Gallery, Chicago, IL. December 2017. Solo Exhibition at Galerie Sebastien Adrien, Paris, FR. February 7th – March 20th, 2018. Solo Exhibition at Freight + Volume, LES, New York, NY. Spring 2018. About the author: Julia Gray is a writer, creator, producer, and active consumer and critic of music, art, film/TV, and fashion. Her ambition is to utilize storytelling media to amplify unique and underrepresented voices.